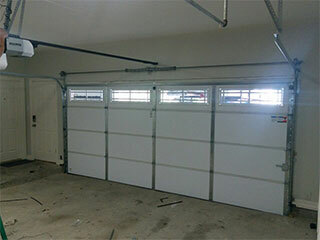 One of the most important parts of the overall system that lifts and closes your garage door is the springs. They provide the necessary power to open the door, as it’s heavier than you might expect. This is why one of the best ways to ensure that your door will work well and reliably is by ensuring the springs are in good shape. Attempting to take care of it yourself is just asking for trouble, as not only can you worsen the issue and through off the whole system, but you can also harm yourself in the process. It takes careful precision to not let the spring snap, or the door itself to fall, which is why you should leave it to the experts. Should I Care About Spring Type? In terms of whether we can service it, no! We can take care of either kind of spring. However, it is best to know the type you have so you’re aware of the specific needs that may come with it. Torsion springs are simple, they twist up to create and store energy that’s released to lift the door. Extension springs, however, are pulled taut to do this. This stretching daily causes them to wear down much faster and break quicker because of it, so they will likely require more work done on them than torsion springs. Our professionals would be glad to come out quickly and get to work on whatever may be causing your springs’ problems. Whether it needs to be adjusted back into place after shifting over the years, or if it requires a replacement because it’s no longer functioning properly, we’ll get it done in no time at all. We’ll inspect all of your springs to make certain they’re in good health, and also test the door to confirm that it’s moving easily again. Just call Garage Door Repair Forest Park for all of your garage door needs!